The participants were asked to name learner groups they wanted to reach out to and the challenges in engaging them into learning. What are the target groups currently under-represented among the adult learners? What challenges do we face in engaging new learner groups? 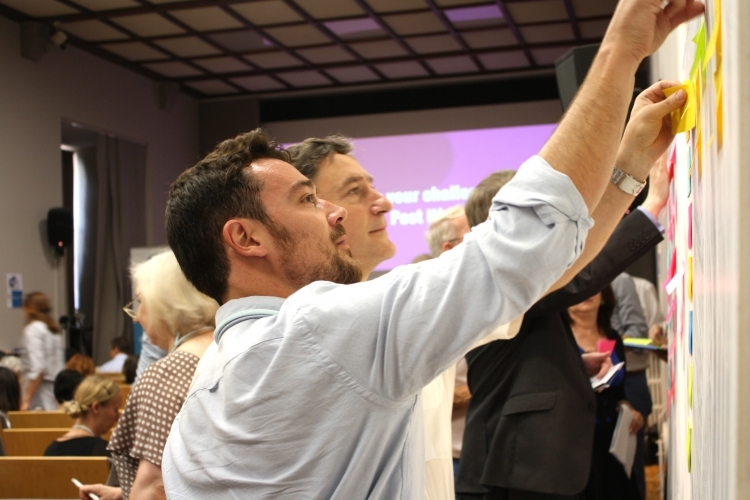 The EAEA Annual Conference focused on the theme of engaging new learners. “Education is a path for better societies and cities. 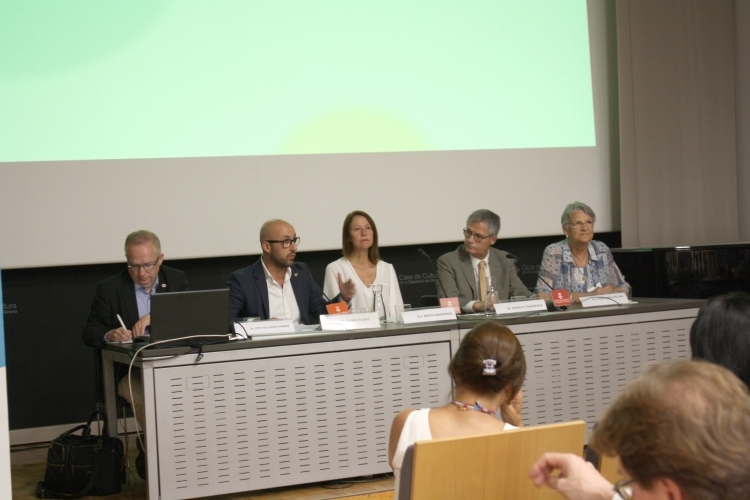 The administrations should collaborate with entities like ACEFIR and EAEA to make adult education a tool for welfare and social cohesion,” said the Mayor of Girona, Marta Madrenas i Mir in the opening session of the Annual Conference. The Mayor had stressed earlier that it was not a coincidence that Girona had been chosen as the venue of a world-wide conference on adult education, as the EAEA Annual Conference, but that the city has the potential and is committed to be the substratum to achieve critical citizens, of which adult education can contribute to. The opening of the conference. From left: EAEA President Per Paludan Hansen, Jaume Dulsat Rodriguez from the Cultural Centre of Girona, the Mayor of Girona Marta Madrenas i Mir, Eudald Casadesús from the Territorial Delegate of the Catalan Government, and Rosa M. Falgàs from ACEFIR. 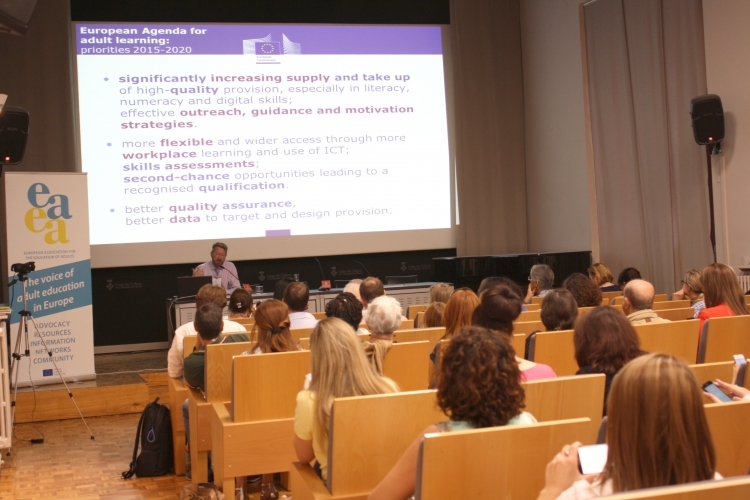 Paul Holdsworth, Team Leader on Skills for Adults in the DG Employment in the European Commission, presented the adult education and skills policies that tackle engaging new learners from the perspective of the European Commission. He recognised the wide benefits adult education has both to the individuals as well as to the society. “Adaptability, social inclusion, better health and wellbeing from the individual point of view, and for example economic growth, social cohesion and stronger democratic life from the societies’ point of view,” he summarised in his presentation. He also stressed the importance of flexible learning opportunities. ”Learning should be flexible and adapted to the learners needs,” he said, referring also to the Council Resolution EU Agenda for Adult Learning (2011). Paul Holdsworth from the European Commission presented the Upskilling Pathways initiative. As a tool to more tailor-made learning opportunities, and especially to tackle the issue of the low-skilled in Europe, the Commission has launched the initiative Upskilling Pathways. According to the statistics, there are around 64 million adults with low literacy, numeracy or digital skills. Paul Holdsworth presented the three steps of the initiative, the skills assessment, followed by the tailored offer of education and finally validation and recognition, and emphasised the role of the Member States in putting the initiative into action. He stated that to engage new learners, the Upskilling Pathways, as well as other European policy initiatives such as the European Pillar of Social Rights can offer a framework. He also highlighted the importance of outreach to different groups of learners in adult education and stated that it is at a high rank also in the European Commission. 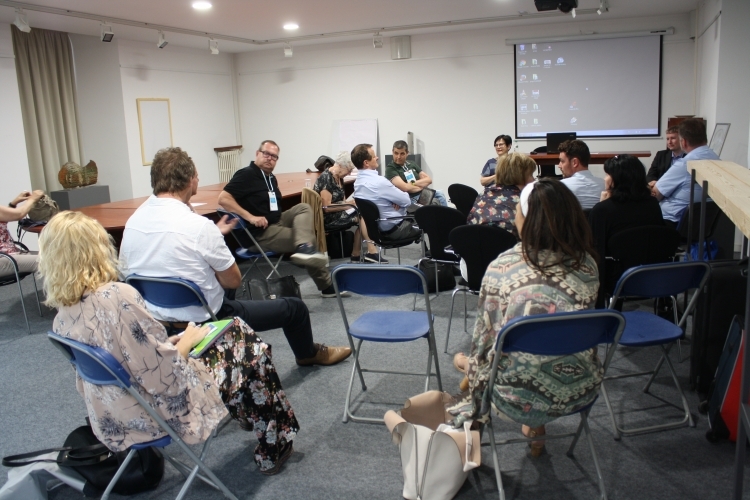 As an inspiration, he presented some of the Commission-funded projects, among them, the EAEA-coordinated implOED project that aims to improve the involvement of migrants and disadvantaged groups in adult education. A learner story was offered by Christina Omideyi, who has founded the OK Foundation to help the disadvantaged people in London. Her main job is barrister but she wanted to add value to her charity work and trained to be a chef in order to open up a soup kitchen for the homeless. Christina Omideyi (in the centre) told her learner story to the audience. On the right, the Chief Executive of the Learning and Work Institute, Stephen Evans. “It has given me a lot of pride to be able to show off and make use of my new skills,” Christina Omideyi said. She has used the learning and new skills to develop her charity. Now they also organise cooking and healthy eating classes for the disadvantaged. She is convinced of the power of adult learning and its impact. She emphasised the importance of finding what motivates people to engage new learners. For her charity, the soup kitchen has convinced more people to join the activities. The thematic workshops gathered the participants to discuss the topic of engaging new learners from the perspective of different learner groups. Monika Tröster from DIE Germany presented the Curve project on financial literacy at the working group discussing the topic of adults with low basic skills. The project has developed a competence model of financial literacy. “The big networks and cooperation with different actors is important in engaging new learners,” she stated. EAEA Board Member Susana Oliveira lead the workshop on SMEs and adult education. The workshop on migrants and refugees discussed the motivation of learners. The workshop presented an example from Ireland, the EPIC project that has been successful in supporting migrants to find work. “The innovative learner-centred approach that finds out exactly what the learners need, is one of the key factors behind the project’s success,” said Katie O’Rourke from AONTAS, a participant from the working group. The workshop focusing on the topic of young adults highlighted that young people themselves often define what they want to learn when it comes to citizenship and social skills and they should thus be engaged in their own learning pathways. It’s especially important to reach the young adults to also ensure they are not left out socially. The participants of the workshop on young adults. “Lack of social networks is a challenge for young adults. Finding a place of belonging can really make a difference!” Liz Waters, the President of AONTAS, summarised the discussions of the workshop. The fourth working group focused on the role of small and medium enterprises (SMEs) in adult education. 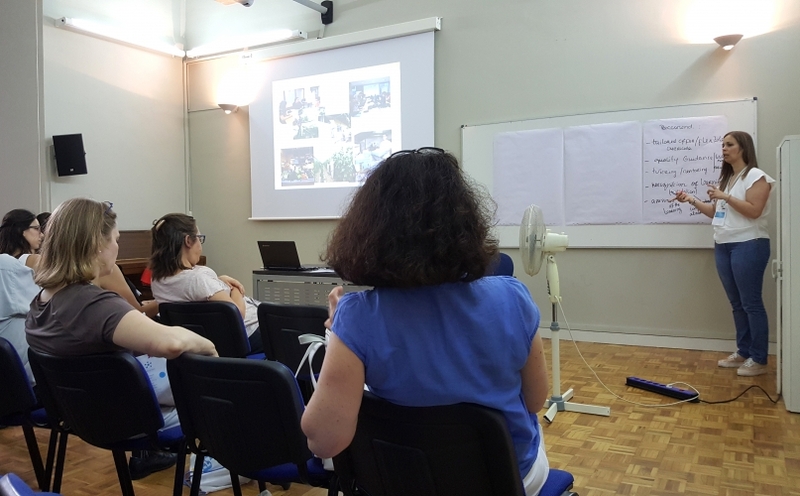 The workshop presented an example from Catalonia on social enterprise working with people with mental health problems – first step is to assess what people can do and want to do. 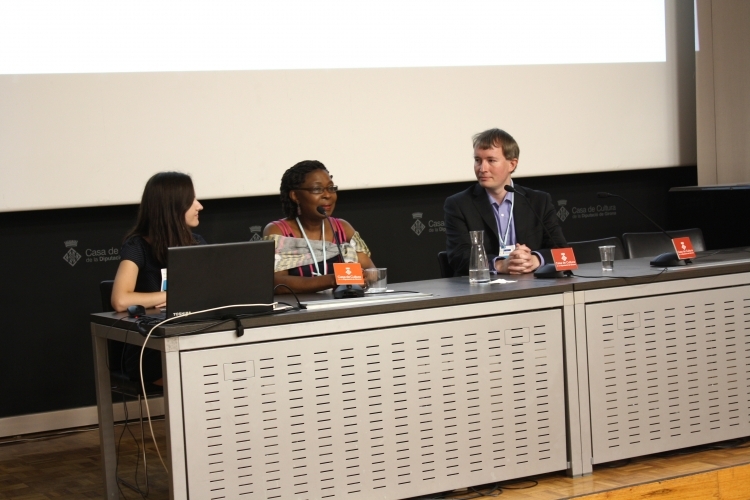 “It’s important to understand the needs and to also validate the prior learning,” said Galina Veramejchyk from the International Public Association “Education without Borders”. In the final discussion, the participants discussed the importance of not only the learning but also the teaching. Modern technology offers many solutions to teaching but in adult education it needs to be combined with empathy in order to provide lasting results. A fish bowl discussion on the conclusions of the conference. As well as new innovations and approaches to engaging new learners, is the importance of rooting them. “Besides new projects, we should focus on how to transfer the good ones to other places. There are often not enough funds to upscale them,” Gerhard Bisovsky from Austrian Association for Adult Education Centres said. 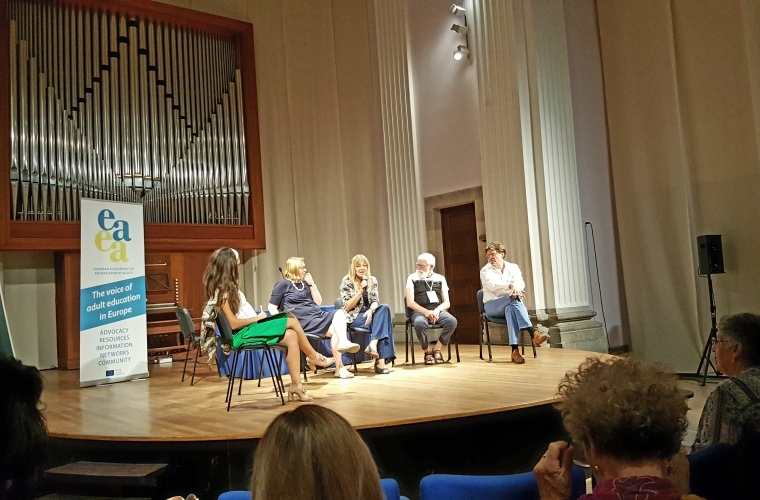 “We need to improve learning but we need the funds and frameworks to implement all the innovations that we have developed,” concluded Gina Ebner, EAEA Secretary-General.